Using the Lonely Planet Travel Book as the definitive list, this is an A to Z of sampling every country's cuisine....without leaving the confines of the M25. Jackpot! 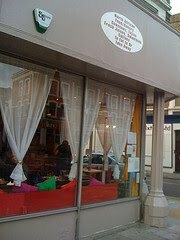 Khamsa, situated in an unassuming corner plot on Acre Lane, half way between Clapham Common and Brixton, is a real find. This week we had substantially more choice. London has it's fair share of Algerian/North African establishments, but we decided on Khamsa, based on consistently good reviews and the fact it wasn't too far from home. We hadn't booked and were early enough to get a table for 3, but I wouldn't risk turning up without a reservation later in the week. It's not a huge restaurant, but was pleasantly busy for a Wednesday night. A rainy dreary evening in London, but the inside of Khamsa was warm and colourful. The walls are decorated with bright throws and there are plenty of cushions and candles to add to the atmosphere. So down to business....the food. We started with some drinks: freshly squeezed juices of apple & mint and pear & basil. Khamsa is not licensed, but you are able to BYO. To be honest, I didn't really want any alcohol (yes, yes, I know, you don't often hear me say that! ), the food is so tasty, it would have detracted from the dining experience. 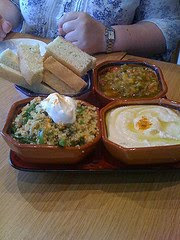 For starters, we selected a number of small dishes to share - hummus, couscous and ajhroum di felfel (pepper and tomato salad). These were served with some freshly baked bread for dipping. All delicious and generous portions. We then opted for 3 different tagine (in Algeria, djwaz) dishes. I had an unusual salmon and couscous foil wrapped parcel that had been cooked in the djwaz, nice tang to it with lots of spiced aubergine. Suzanne had a chicken, sweet potato and spinach dish and James went for beef with chickpeas, served with almond & pomegranate flavoured couscous. These were all served in individual tagines and were extremely filling. We left just enough room for pudding and coffee. And thank goodness we did, as this is where Khamsa really comes into it's own. The chef/owner is rightly proud of the bakery, everything cooked on site and with a wide variety of ingredients. 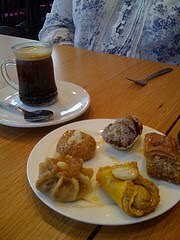 To finish up our meal, some spiced and rosewater Algerian coffees accompanied by a plate of 5 different pastries to taste. The date and basil morsel was to die for. This is definitely a restaurant I'd recommend if you find yourself in Brixton/Clapham. We'll certainly be returning, probably when we're next on the way to the Academy and looking for something good to eat before the gig. Great night, Khamsa! Will "A" end up being for Algeria?? More photos of the evening at Khamsa at my lourobbo flickr account. Khamsa was great - will definitely be returning!